A conservatory is an attractive way to extend the use and value of your home but all to often the can be too hot to live in without suitable shading. 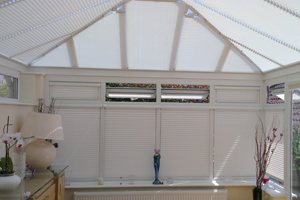 We supply and fit a variety of conservatory blinds including the innovative INTU and perfect fit systems. Vertical blinds provide a cost effective solution to shading the windows. Louvres can be rotated through 180 degrees and drawn to the side when required. Cost effective solution for windows.